Before gaining international acclaim with his very serious graphic novels Blankets and Habibi, Craig Thompson indulged his sillier side by creating cute, strange comic strips for Nickelodeon Magazine, embracing a cartoonishly exaggerated aesthetic that he would move away from over time. 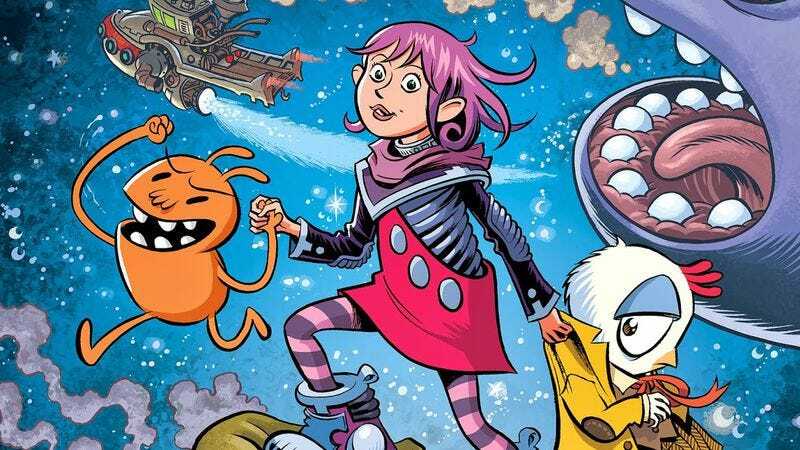 His new all-ages graphic novel Space Dumplins (Graphix) is a return to that goofier mode, detailing the cosmic adventure of a girl, Violet, and her two friends as they traverse a galaxy full of floating garbage and whale diarrhea to save Violet’s father. The story builds on the themes of family, spirituality, and environmentalism that have been major driving forces of Thompson’s work, but he does so in a dramatically different context, combining concepts and imagery that already have a proven track record with kids. Thompson’s artwork incorporates marine influences into a sci-fi design sensibility that fluctuates between trash-filled wasteland and a shiny, technologically advanced utopia, making the book’s setting feel like a mix of Finding Nemo and Wall-E, populated by aliens that would feel right at home in Monsters, Inc. The cartoonist knows what his target audience likes, and starting the story by destroying Violet’s school and thrusting her into a world of wonderful privilege pulls young readers in with imaginative escapism. Thompson tells a fairly traditional story about a group of children banding together on a fantastic journey, but that’s not necessarily a bad thing. Following conventional plot beats allows Thompson to focus on strengthening character relationships and building increasingly impressive outer-space visuals, giving the book heart and spectacle that make up for any derivative story elements. Thompson is trafficking in a lot of metaphors in Space Dumplins: The whales represent energy companies whose work leads to loads of garbage and the occasional oil spill (whale diarrhea) that does massive damage to the environment; the inhabitants of the sophisticated, isolated space stations communities represent privileged people who don’t have to worry about the immediate effects of climate change; and working-class folk like Violet’s family represent those that take the brunt of the suffering when disaster strikes. The story may take place in the stars, but its message is strongly tied to the degradation of Earth’s environment, teaching kids a valuable lesson about the importance of finding alternative energy sources and ways to reuse mountains of waste. The “my parents are dead club” is a big one for comic book characters, as the untimely and sometimes violent death of a mother or father (or both) is often used to fuel the transformation from John Doe to superhero. In the Bat-family alone there’s enough dead parents to fill a school bus. Despite all that, parental figures often loom large in the minds of both characters and readers, laying the foundations for the men and women that the superheroes strive to become. Kal-El without Martha and Jonathan Kent is an entirely different character, as both Superman: Red Son and Supreme Power demonstrate. It’s hard to believe that Spider-Man without Uncle Ben and Aunt May would ever discover his great responsibility. For too long, not-quite-parents have been the ones to raise successful heroes; Bruce Wayne has Alfred, Tony Stark has Jarvis, most of the Robins have Bruce. It’s rare that a comic book character has living parents, let alone a positive and supportive relationship with them, and it’s refreshing to see something entirely different. Raising Dion is the story of a black woman raising her superpowered son, combating forces that would hurt him or take him away, all while figuring out how to nurture a child that can make himself invisible and shoot lightning from his fingertips. Written by Dennis Liu with art by Jason Piperberg, Raising Dion #1 (available for print on demand from the author) is a prime example of how the internet has completely changed the way comic creators do business. Liu and Piperberg are not well-known names. Liu’s previous work includes commercials and music videos, but he doesn’t make the all-too-common mistake that people accustomed to working with cameras make in assuming that comic books are basically fleshed-out storyboards. Liu made a stellar trailer as a companion piece to the comic that proves just how much thought he’s put into the long-term plot for the book. You do not need to watch it in order to enjoy the comic, but it certainly does make the impatience for more issues even stronger. Piperberg’s style is well suited for this first issue, which focuses on Dion’s mother and father, Nicole and Mark. Readers very rarely get to see this part of a superhero’s origin story, and if it is put down on the page it’s as a flashback. But the implication here is that Nicole, whose artistic talents are discussed throughout the issue, is the one telling her own story in the first person. Piperberg has clean, graceful lines that are difficult to describe as anything but pretty, and the color palate is bright and charming without being cartoonish. The art matches Liu’s lighthearted humor as Nicole and Mark flirt and begin their lives together. It’s a comic book with romance tucked into it strategically, while the focus remains on what’s going to happen when Dion is born. An anthology that collects the work of cartoonists from around the world, š! #22 (Kuš!) (pronounced “sh”) ties its stories together with the theme of “fashion.” However, in grand š! tradition, that theme is broached ambiguously. It appears as a plot contrivance, as in “Stoplight” by Latvian cartoonist Oskars Pavlovskis. But in Anna Deflorian’s “Object Petite A,” the narrative itself is loose and constructed by juxtaposing a sequence of images intended to approximate the look and feel of a magazine spread. Her line is illustrative with a touch of abstraction, and her women are well dressed and sharply put together; she convincingly emulates the just-so, calculated posturing of fashion spreads. Still, others approach the topic even more obliquely. Anna Deflorian's "Object Petite A"
Roman Muradov, for example, contributes “Picnic, Priest, And Plumber,” which regards a young woman bringing a priest to a picnic—as a novelty. He appears to sidestep the theme completely, though a tenuous argument could be made for it being about a rejection of the current fashions, trends, and fads. However, his ability to create a compelling space for his characters makes his story deeply engaging—full of rich visual stimuli. His line is stripped down and minimalist, but his aesthetic overall is complex. The intricate and careful interplay of opaque smears of ink and color are at once comforting and puzzling—the kind of riddle that gleefully compels you to unravel it. Still more obfuscated than “Picnic, Priest, And Plumber,” is “g” by the Portuguese cartoonist Hetamoé. Her story is a kaleidoscopic array of colors that blur into one another. Text is rendered in colors that clash with the art and blend into it, making it a laborious task to decipher. It’s something that needs to be deciphered to be fully understood, but it doesn’t require understanding to be enjoyed. It’s Hetamoé playing face-melting noise comics licks, and she draws more to approximate an emotion, or a sensation, than a story. It’s a shock to the system, and it stands out from more overtly narrative pieces. Roman Muradov's "Picnic, Priest, And Plumber"
Spanish illustrator Ricardo Cavolo takes this principle to its obvious conclusion with 101 Artists To Listen To Before You Die (Nobrow). Although on first blush it appears to resemble an actual music guide of the kind you might expect to see on sale at Urban Outfitters, on closer inspection it reveals itself as something significantly different, and infinitely more interesting. Rather than a simple list, 101 Artists To Listen To Before You Die is a narrative, the story of Cavolo’s life told through a catalog of his favorite musicians, told more or less in chronological order from his youth through to the present day. Cavolo draws these figures with a style that could best be described as welcoming. For each artist portrait he gives the reader not merely a visual description but a subjective interpretation as well. Facial tattoos present a key to his affective connections: Motörhead is covered in lightning bolts and surrounded by storm clouds. Iggy Pop has a lightning bolt, too, but also a lot of fire. Kanye gets a three-eyed unicorn. Lightning, fire, skulls, and stars are motifs throughout. The illustrations seem larger than the pages themselves, like graffiti tributes or mural tattoos. It’s a great book for browsing: rather than reading front-to-back, better to flip through the book and stop whenever you find something striking, or come across a favorite artist. The book is at pains to present itself as a purely subjective travelogue. Who at this point can hope to write anything new about the Beatles? Cavolo tells us, instead, what the Beatles mean to him: He likes the early Beatles better, because they remind him of Buddy Holly and also served as an introduction to other British Invasion bands like the Kinks. There isn’t a lot of hipster cred to be gained from pledging allegiance to the Velvet Underground or Neutral Milk Hotel, but it’s interesting to read Cavolo’s own words as to what exactly he gets from listening to these bands outside of any need to follow a predetermined critical narrative. He likes to draw to Neutral Milk Hotel and its music reminds him of a Diane Arbus photo. What better explanation do you need for why it matters?